« Clever Parody on Math in Schools! This post will explain how to prepare the paper for making cursive masters which can be photocopied for students. Not every teacher has access to cursive workbooks. In addition, there are some problems with the cursive workbooks, such as not being able to turn the book on the proper angle to write, without great difficulty. 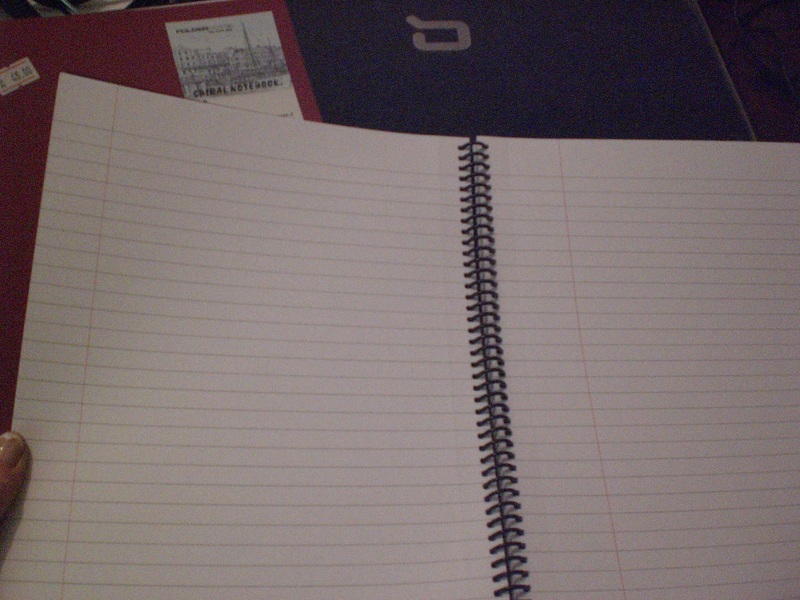 Take a sheet of wide-ruled paper (11/32 of an inch, or 8.7 mm spacing between horizontal lines) as in the top photo; or cut, tape, and photocopy two sheets of paper as in the second photo above, depending upon your preference. The second horizontal style is especially nice to use with younger children because it gives them a half-lesson to work on at each sitting, and seems less intimidating. 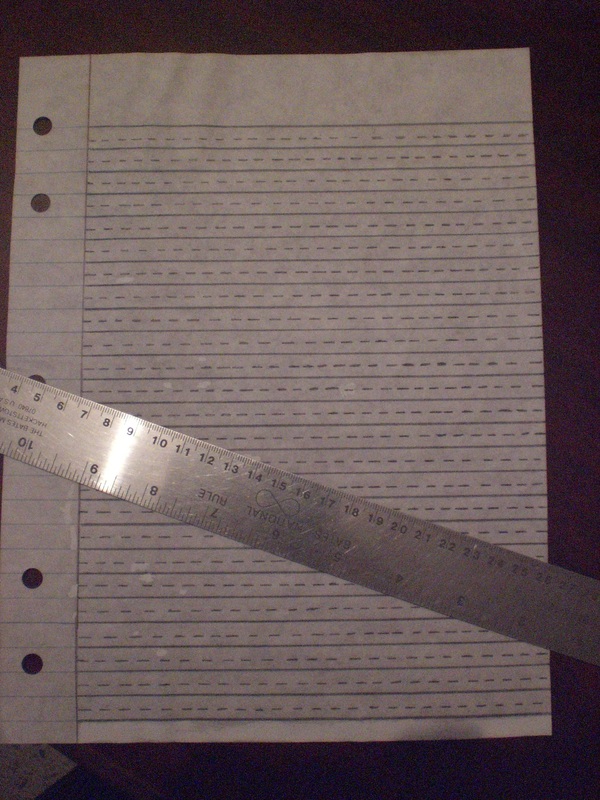 Next, take a ruler, and draw dotted PENCIL lines at the midpoint between each ruled line. 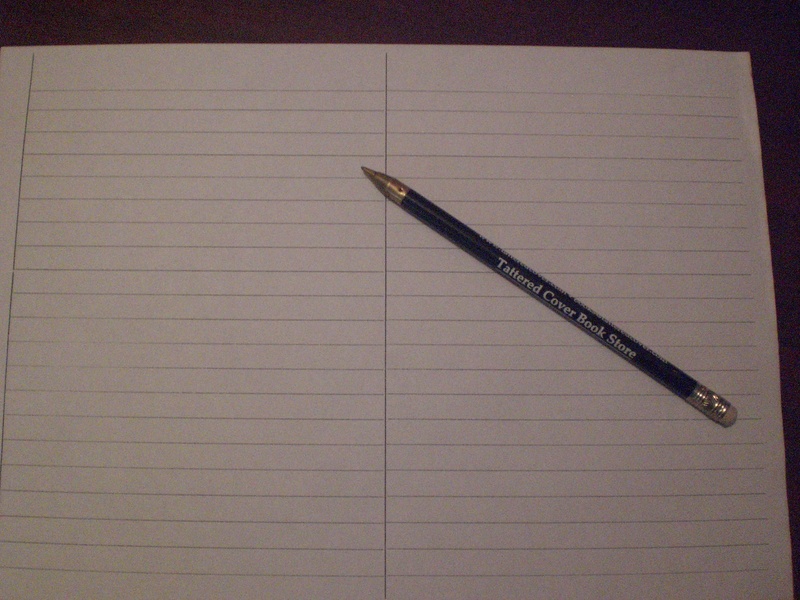 It’s important to use pencil for two reasons. First, you can erase and correct any line which doesn’t come out quite right. Second, after you are satisfied with the lines, take a can of hairspray and spray it thoroughly. The paper doesn’t have to be soaking wet, but just be sure you cover all the pencil marks. This makes the lines permanent so that they cannot be erased. If you use pen or ink to make the lines, the hair spray will cause your dotted lines to bleed into the paper. This problem does not happen with pencil. Now your master is ready to photocopy. Make approximately 30 photocopies, on which you will make cursive masters for various letters (and numbers). The next post will deal with how to write the cursive masters. Part 1: What NOT to Do When Teaching Cursive! This entry was posted on August 14, 2011 at 5:18 pm and is filed under Africa, Alaska, American Culture, Argentina, Australia, Bahrain, Bangladesh, Belize, Brazil, Britain, Canada, Chile, China, Colombia, Costa Rica, Cursive, Dubai, Ecuador, Education, Egypt, Elementary Education, England, Expats, France, Germany, Greece, Handwriting, Hawaii, High School, Home Schooling, Homework, Hong Kong, India, Indonesia, Intercultural, Iran, Ireland, Israel, Italy, Japan, Jordan, Korea, Lebanon, Libya, Macau, Malaysia, Mexico, Middle East, New Zealand, Pakistan, Palestine, Paraguay, Parenting, Penmanship, Peru, Russia, Saudi Arabia, Schools, Scotland, Secondary Education, Singapore, South Africa, Spain, Students, Syria, Teachers, Teaching Cursive Handwriting, Thailand, Tunisia, Turkey, Tutoring, UK, Ukraine, United Arab Emirates, Uruguay, Venezuela, Vietnam, Wales. You can follow any responses to this entry through the RSS 2.0 feed. You can leave a response, or trackback from your own site.